What was your income last month? What’s the average listener to the podcast making in their business? How long have they been in business? I’m sharing it all in today’s episode. 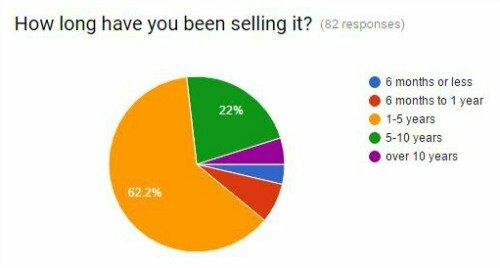 All told, there were 80 responses, and of those 37% make handmade products and 47% sell patterns or designs I've split up the answers into two sections and will talk about each of them separately. Watch or listen to the episode to hear all about it! Of all the people who are rocking their goals, their secret formula was consistency. More on that here. Want the break-down of all the responses and my notes? Enter your email into the box below and I'll send you the transcript for this episode! What do people REALLY make in their handmade businesses? 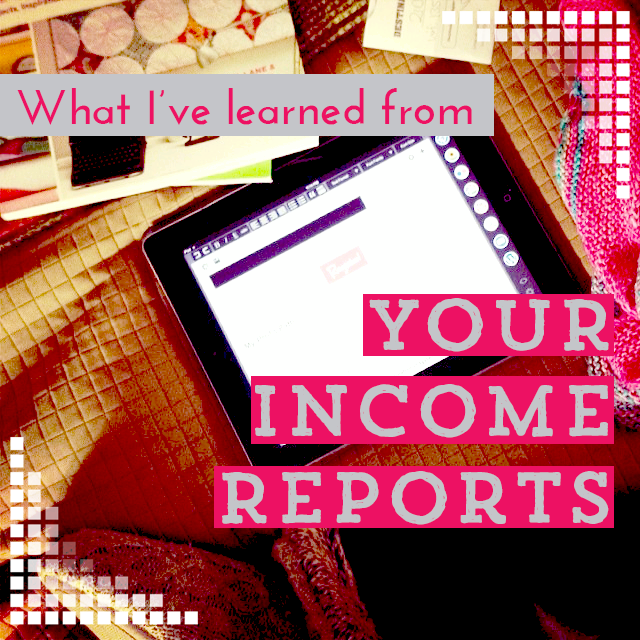 Two years ago, after seeing tons of income reports from bloggers & coaches I started to wonder what an income report would look like from a maker. The reports I saw from bloggers and coaches were just NOT comparable to a handmade business. It’s way more useful to know what lots of people are doing than what ONE superstar is doing. So I created a survey, where you could share your numbers and your feelings with me. And I’m doing it again this year. You can go to taraswiger.com/income and share your response with me totally anonymously. Wanna know what handmakers earn? @TaraSwiger's doing a survey to find the answer! Listen to the episode to find out why it's important to know your numbers, and also to put them in context. 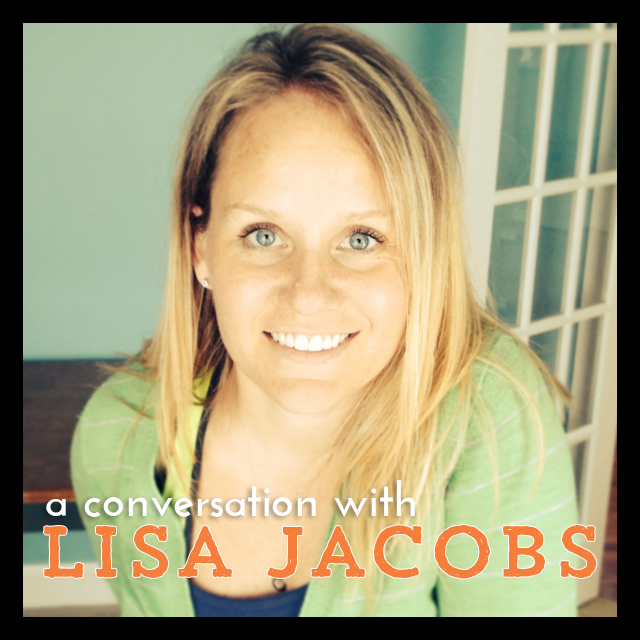 Lisa Jacobs has built a jewelry business on Etsy (The Energy Shop), is a marketing consultant for creative entrepreneurs, and she recently taught with me during the Improve Your Holiday Sales bootcamp at CreativeLIVE. 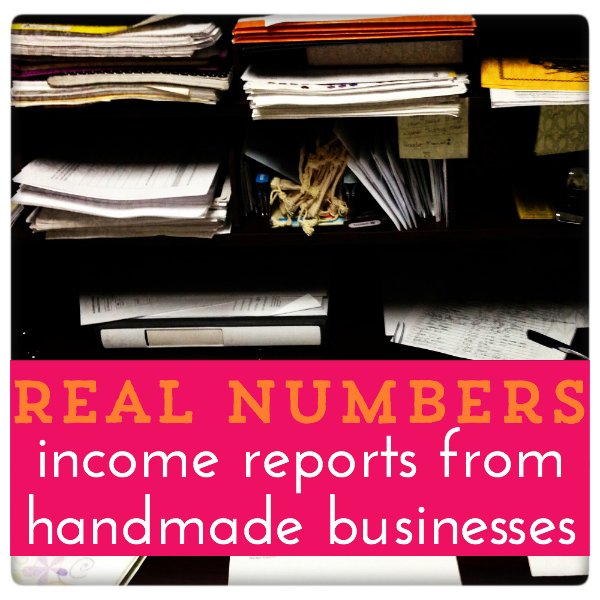 Over the last two weeks, I've shared the Real Numbers, via Income Reports, of other makers just like you. (Find Income Reports of Knitwear Designers here and Handmakers here.) This whole project has opened a lot of conversations and has taught me a lot. Today I’m distilling it all into 5 lessons. 1. MANY many businesses (ie, people who specifically marked it as a “business” and not a “hobby”) had no idea what their numbers are, in a single month. I got many messages from makers who wanted to fill it out, but they couldn't. They didn't know where to start in gathering their numbers, or maybe even what the terms meant. This bummed me out, because you can't fix what you don't measure. There's no way of knowing if what you're doing is working unless you've got a way to measure it. 2. Many makers don’t know what they want. When I asked in the survey “How do you feel after answering these questions?” the responses ranged from “Depressed” to “Scared” to “Excited!” That's perfectly normal. I feel all of the above, just about every week. That's just part of being an entrepreneur and building something completely new. But what stood out for me were the number of respondents who said they didn't know how to feel about it. Is it good? Bad? They didn't know what their numbers meant for their business health. That makes sense, because numbers don’t mean anything on their own. For example, let’s say you made $20 yesterday. That might be an awesome day if you sell $5 products, or if you don't make daily sales. It might be a miserable day if you sell $500 products, or if you want to make $2,000 a week. If you don't know what you want from your business, you won't have any context for what a specific number means. Remember: No one number has meaning without context. Solution: Put them in context! Get clear on what it is you want from your business by defining success. If you don't know what you want from your business, you won't have any context for your numbers. 3. Many makers feel disappointed and overwhelmed. What's interesting is that disappointment and overwhelm aren’t correlated to the income numbers. We all feel it at one time or another. But it did seem to be correlated with how much the respondent understood cause and effect in their business. In other words, if a maker is measuring other numbers (conversion, email subscribers, etc. ), they are less likely to be overwhelmed. Why? Because they know what they can do. They recognize that they have options, and that they can experiment. I've seen this to be true, time and again. Just understanding the variables that affect your sales, and how you can experiment with those variables to increase sales, can keep you from feeling so hopeless about your business. 4. When you focus in on what matters in your business, everything else becomes obvious. Several of your fellow readers wrote me to say, “After doing these numbers I realized that I've been wasting my time worrying about X” (X = all the things that have nothing to do with the 4 important business foundations. All the things you think you “should” do). 5. You are not alone. Whether you don't know what your numbers are, you don't know what you want out of your business, or you just feel overwhelmed with figuring it all out – you're really, really not alone. There are hundreds of other makers who feel just like you. Good news: this confusion and overwhelm can be overcome by focusing in on what you want and building a business based on that. You don't have to feel like this forever. I've worked with dozens of makers who feel a zillion times better about their business. In fact, I created a program to help you do exactly that, and it's open now (come on inside here). 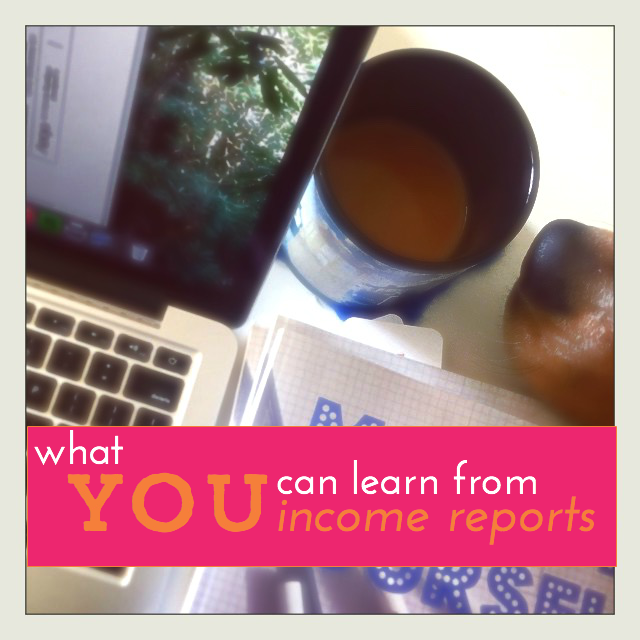 What did you learn from the Income Reports? 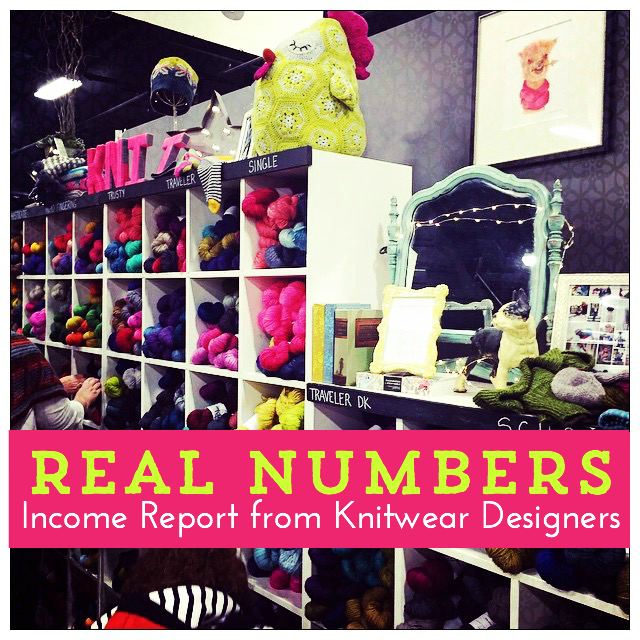 Last week I shared the income reports from knitwear designers and this week I’ve gathered up the data from makers who sell a product. These numbers were self-reported in my Real Numbers Project Survey, which was completely anonymous. Please remember, before you dive into the numbers, stop to think about what you can learn from the numbers. This batch of reports has a much bigger range in income AND in lessons from the numbers. Next, we'll look at some real numbers, from the youngest, the oldest (and most profitable!) and two that represent the middle. After the reports, I’ll share the findings I found most interesting. What do you make or sell? Do you consider this a business or a hobby? 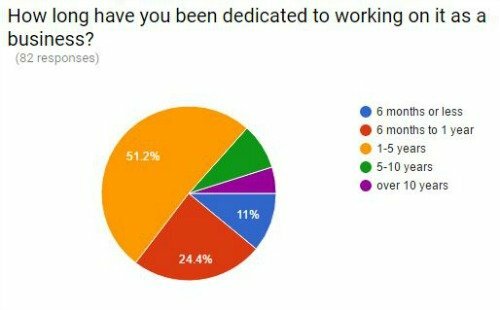 How long have you been dedicated to working on it as a business? What was your gross income last month? How much were your expenses last month? What was your net revenue? Was last month a normal month? Normal – I’m working on a full launch over the summer and into the fall. What aren’t the numbers telling me? That presently the focus is on getting the branding right, the product line more established. We are working on building “trust equity” with our audience before we start any kind of focus on sales and we understand things take time. What else do you measure month-to-month? Do you focus more on a metric other than money? Trust and loyalty. We are working on building and sustaining an audience that is loyal to our values and the brand's values. Where do you think most of your sales come from? What kind of marketing do you do? How do YOU feel about the money in your business? It's fine, and exactly where it was expected to be. What’s your goal for your business, big picture? Where do you want it to be? To be a thought leading brand within the “tribe” that is our audience. Confident. Much of our research has been about understanding the needs and aspirations of the group. What was it like answering these questions? How do you feel? Is there something in particular you think helped move your business forward? Building trust with the core audience. Was there anything that you’ve tried that just did NOT work for you? Overselling, maybe? In other words, overdoing social media selling … Otherwise, nothing yet. in person at events – farmer’s markets, craft shows, etc. Higher than usual for not having a craft show in the month … being almost exclusively Etsy sales (almost all custom orders). Lower than the average month that has a craft show. $290.00 of the expenses was prepaying for 2 large craft shows much later in the year which are very well attended … my first time participating in such large shows. So my expenses that actually relate to the last month are actually only $70.37. Facebook and Instagram several times per week. It is growing at a slow but steady pace. This year is a test. My goal is to make enough with my pottery business to take one day per week off from my day job next year, growing that to 2 days in a few years until eventually I can work just a couple of days per week at a day job and focus on growing my business. Some days I feel that it is too slow, and that in order to grow the business, I need to be taking time off work now … but I need to make sure the market is there before I can take the jump. Nothing really surprised me as I have been thinking about these things from my reading and listening to podcasts (thank you Tara Swiger). Anything else you want to tell me or your fellow creatives about your numbers or how you feel about them? For most people who participate in craft shows, I don't think looking at one month individually is a very accurate depiction of profit vs expenses because it seems that all of the craft shows for the year have to be paid for in a period of about 2-3 months – and usually before any of them actually start. I only do about 6 craft shows or so per year, and 5 of them need to be paid for in the March – May window, even though the first one doesn't start until mid-April. I am tracking my numbers over the period of 1 year to see if I reach my “magic number” by the end of the year (so far, I'm almost – but not quite – on track to reach it). Plain and simply dedicating more time to my small business. Since December or January, I have made a conscious effort to do “something” each day for my business … whether that be making new products, advertising, listing on Etsy, working on packaging or branding, etc. This is done every evening and on weekends as I still have a day job. Facebook does not work very well for me as I do not have many followers so far. With each show that I do, my audience grows, but only a handful at a time. What did you do with the profit, if there was any? Last month was the highest non-holiday month I've ever had. Looking at where I was last year, two years & five years & ten years ago and seeing how far I've come. Twitter, newsletter, Facebook, word of mouth, some yearly craft shows. I'm very discouraged that I make so little income for all the time and work I do. I want for my business to pay for all of my expenses. I've seen improved sales these past weeks and I'm continuing to improve and expand my product line & improve as a seamstress, so I think that it's realistic. However I often have days, weeks & months where it does not seem or feel realistic at all. Re-branding my business last year from using recycled fabrics to using new fabrics. Blog features and giveaways, don't think this led to any sales, really. What I hope you see here is that the happiness or contentedness of the answerer aren’t correlated with the income (or “success”) of the person’s business. Instead, they are related to that person’s goal and where they think they “should” be by now. People making $0/month and $1000/month both wrote that they felt doubt and worry. People making $0 and $15,000 both felt excited and encouraged. You see, it’s not the numbers that matter, it’s what you choose to do with what you can learn from the numbers. I also noticed that of the business owners who made more than $1,000/month, NONE of them were suprised by the numbers – in fact, they all had the numbers easy to gather, while businesses who made less than $300 had to spend more time gathering the numbers, and many of them were unsure of their exact expenses, or the answers to some of the marketing questions. One way of looking at this is that people who don’t make very much per month don’t feel pressured to keep up with it. But I’ve learned by working with students long-term that the very act of getting on top of your profit margin increases your sales. When you know your expenses, you’re sure to price right. And when you know what you made in one month, you can make changes (and measure the results!) to increase your sales next month. If you don’t know your numbers, I strongly recommend that you take a moment now and do the math. You can use Pay Yourself to learn how to do the math, and to identify the profit margin of your products and your business’s break even point. It’s my hope that this Real Number Project has given you a dose of reality and encouragement. I’ve heard from so many of you that you’ve loved it, and that thrills me! Please remember not to compare yourself, but to learn what you can, and then get back to doing your own work. If you feel overwhelmed by all you could do to improve your numbers, let’s cut through the overwhelm. I’ll be sharing (free!) resources about the only things you need to worry about (so you can ignore everything else! ), with everyone who’s interested in Pay Yourself – a program that guides you through building the profitability in your business. 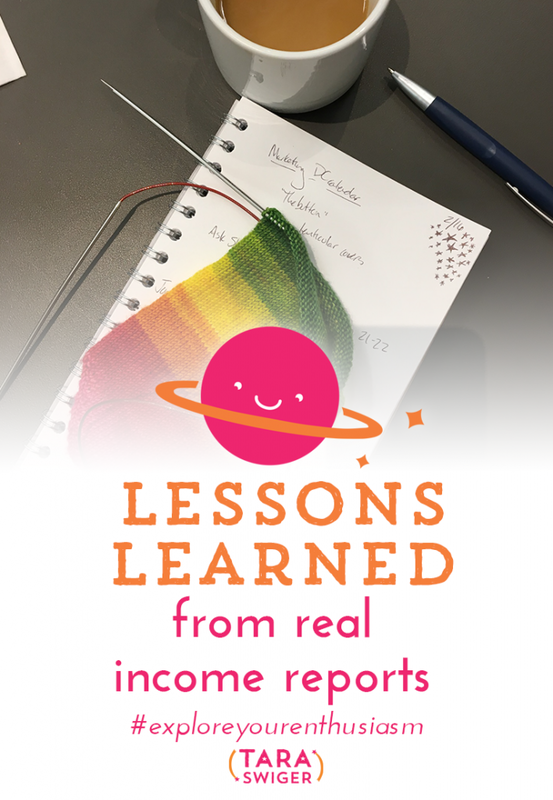 Today we're going to talk about the phenomenon of income reports and how you can learn from them without being distracted or deterred from your own work. Pinch of Yum’s income reports. You know I love Income Reports, right? I love reading what’s actually happening in a small business, and I love that people will just share these numbers with us! Now, not everyone wants to put their income on their website, nor does it make sense for them to! But this means that there are lots of income reports from businesses-who-sell-business-advice but not a lot from other makers. I set out to remedy that a few weeks ago, and launched the Real Numbers Project. Over 50 (!) of your fellow makers submitted their numbers, and now it’s time to take a look at the results! I’ve thought long and hard about how to share this info with you, so that it’s as useful to you as possible. I decided to split the responses into two categories: designers (those who sell patterns) + finished-goods makers. There were other businesses who submitted their numbers (thanks!) but not enough to (yet!) put together a comprehensive look at the numbers. 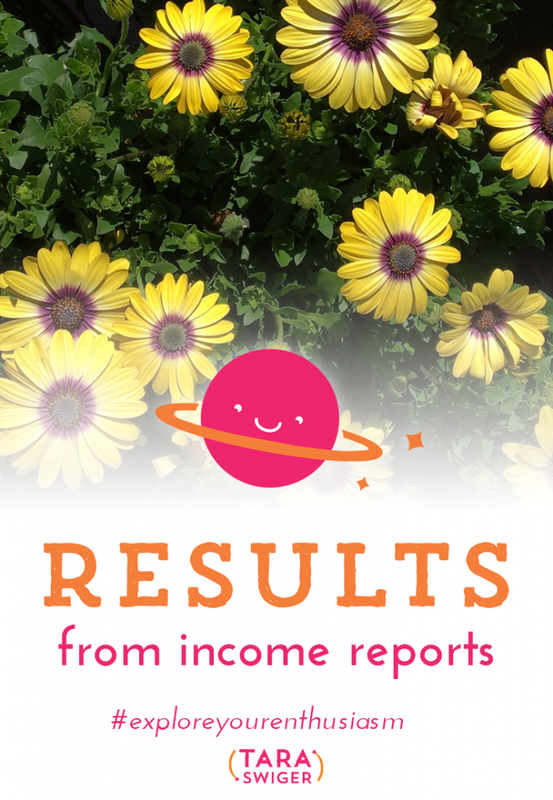 This week I’m sharing the Income Reports of Designers (all of them happen to be knitwear/crochet designers) and next week I’ll send Income Reports of finished-goods makers. A few things to remember: These numbers represent a TINY slice of possible designers. These are the people who either read my blog, or were sent here by a friend, so I can tell you that they are overwhelmingly women, ages 30-60, who have a college degree or higher, who are VERY comfortable online. That means these numbers don’t represent the many makers who make a living primarily offline. I chose to share information from the youngest business, the highest and the lowest numbers that were shared with me, along with a few that represented the majority of respondents (both in sales numbers and time in business.) Based on the emails and comments I received, those with the truly lowest numbers (those who are making no money from their business) chose not to fill out the survey. So you should assume that many people make $0. In other words, these numbers aren’t a representative sample of everyone trying to make it as a knitwear designer, they are representative of the people who are making some money as knitwear designers. What can you learn from this business? 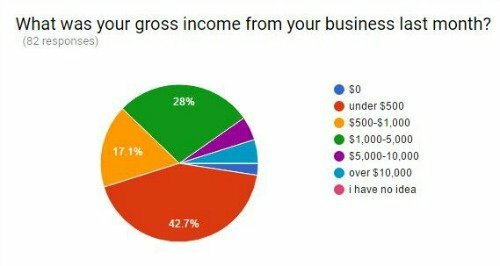 What was your gross income from your business last month? What was your net income? Was the last month normal? What else aren't the numbers telling us? I am still purchasing educational materials to learn more skills. Hopeless, although I suspect I might be selling more than others who have only been going a few months. I track email subscribers, social media followers and number of individual sales. Hard to say. Promoting helps I think but I'm trying so many things I'm not entirely sure which is having the most effect. If you care about something more than sales, what is that specific number? Email subscribers to my newsletter is important – 463 signed up since Jan.
What kind of marketing do you do? How do you spread the word about your work? 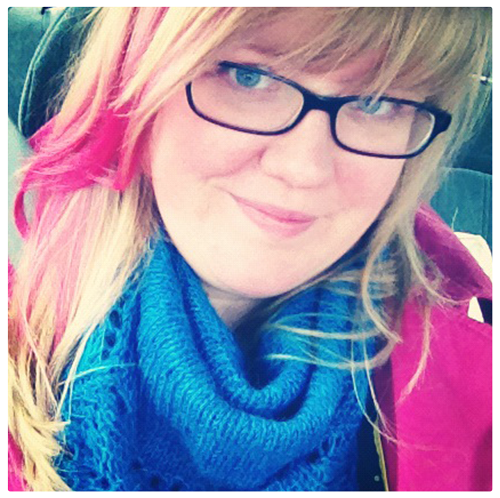 Instagram, Facebook, (automatically sends Instagram to Twitter), blog, podcast, new Ravelry group. Is there something in particular that you feel helped your business move forward? The gradual shift towards believing I could do it. I've been a stay at home mum for over a decade so part of it has been readjusting my beliefs that I'm “working,” not just avoiding housework. I'm not there yet! It's also a major career change from my job before kids so I am working hard at convincing myself that I can actually do this. Was there anything that you've tried that just did NOT work for you? It might be too early to say yet. I am doing a scattergun approach to marketing – sort of – and will narrow things down as I figure out what works and what I actually like doing. What's your goal for your business, big picture? Where do you want it to be? I want to be able to earn a reasonable income from home so I have flexibility for my children. I would love for my job to encompass more than just designing, I'm working at writing, too, and hope to get work from that. I'd like variety. I'm giving myself a few years to see how this works out. I feel slightly frustrated that I'm at the beginning, yet that's also exciting. My biggest challenge is time management. And juggling my existing full time job as a mother! I've just hired a cleaner to come once a week. I have got to start making some money! I'm desperately needing to produce more patterns both to get a bigger portfolio and also to learn more. I'm also still finding my style so I’m expecting it'll be a while before I get any real traction. I'm feeling such a mixture of feelings. My suspicion is that lots of new designers are slower to earn money – but maybe I'm deluded about that?! So a part of me is pleased that I'm earning anything at all. But on the other hand I wonder if it appears I'm doing better than I am so I feel a bit of a fraud. I have a deep feeling that I can do this but I need time. The day to day chugging along is becoming more familiar – although a little voice is telling me I might be putting in lots of effort for a pipedream – that only a few people make money in this business. Confused much?! About average. Summer is worse and Nov / Dec is better. I don't think I earn enough for the hours I put in..
Fun. Knitting, designing and selling make me happy. I love seeing people knit my patterns. The cash I make allows me to spend on expensive yarn guilt free. Facebook, Ravelry groups, Pinterest. I don't do much marketing other than being present on social media and engaging with customers. I get a lot of word of mouth recommendations that way. Being brave enough to submit to magazines. The income is more reliable and I reach more potential customers in a different marketplace. Blogging. I feel uncomfortable and I don't enjoy it enough to make time to do it regularly. I'm much happy chattering on Facebook and posting tutorials on my website. I want to retire early (in about 20 years time). I have pensions which will provide the bulk of my income but I would like knitting pattern sales to provide a reliable income for treats. In the meantime I want it to keep me in yarn & patterns. What was it like answering these questions? I did Pay Yourself so I understand where I am and I'm OK about it. Anything else you want to tell me or other creatives about your numbers or your feelings about them? I don't ever expect knitting to provide a living wage. I treat this like a business but it's really a hobby that pays. Pretty normal for a March for me, up 20% from last year which is my goal for this year most every month. I made a downpayment last month on a new website – a huge investment for me. It's going to eat all my income for the next few months (actually – it will cost the entire 20% increase in my gross projected for this year) but it will pay off for years to come. I'm very excited about taking this step! Awesome! I'm actually making a living at this! Almost entirely by newsletter. I have almost 7500 subscribers and that's increasing by about 300 every month. I use Facebook to chat with customers and Twitter to chat with colleagues. My YouTube videos also drive a lot of traffic. In four years I want my average gross monthly revenue to be $10,000. Like it's pretty doable. Last year my goal was to double my sales and I did that. If I can increase 20% a year for the next four years I'll be there – and I'm on track for that so far this year. I feel so PROUD that I have a thriving and growing business that brings such satisfaction to so many people! Don't rely on anyone else to bring you business. My shop is self hosted and I don't rely on Facebook or anyone else's algorithms. I built my customers one by one. That seems really slow when you're starting – but it's pretty incredible how those single customers add up. I am overly cautious with investment in the business. Don't spend what I don't have. My main commodity is TIME. Do you focus on something other than money? What’s that number? Networking with other small business owners and not being afraid to let my petticoats show. Trying to work with folks that don't understand the maker market—big box marketing. Folks whose heart is in Marketing with a capital M and not Making with a capital M.
To be able to support my monetary, social, and emotional obligations to my family while working as a freelancer in a small town with very few other opportunities in my field (or any field). I'd like to double my business income over the next two years and keep my expenses to about a quarter of my income. That I really do have a plan! I feel very lucky to be able to pursue my goals. I'm a knitwear designer, instructor, author and run a craft website. There are higher and lower months, but this is a pretty normal month. It's incredibly hard to make a living selling $5 patterns. This number includes income from books (which have been written over a number of years), classes as well as product sold on my site, including a subscription-based product. My Craftsy class was a huge leap forward, mostly in terms of street cred. Having a subscription-based service has also helped tremendously in terms of providing a more steady/reliable income. More complicated patterns are NOT what my customers are interested in. Giving away a free pattern also didn't work well, because I find that folks looking for a free pattern are looking for free and don't convert into buying patterns. It's my happiness. I want to keep a flexible schedule and have a job that's intellectually interesting. Having a business takes a long time to build. I've talked to lots of people in this industry, and no one is making a living because they ‘had a lucky break'. Luck may play into one pattern release, but a successful business is the result of hard work and persistence. So, what did you learn? Did this give you ideas (or clarity) for your own business? Remember, there is no good or bad, it’s all just data. There’s what you want and what you don't want. But you have to have your own data. If you don’t know your numbers, Pay Yourself will walk you through figuring it all out. Above all, I hope this showed you that you can build whatever kind of business you want, as long as you know what it is and you’re ready to commit to the work it’ll take. PS. A GIANT thank you to those who shared their numbers so generously. As I hope you can see, your numbers provide both reality and encouragement to others who are struggling.